"I do promotion when it is necessary," she says. "But I always want to get back to the music. The personal appearances and red carpet events are very glitzy, but it's a bit false. In the early days, I think I was probably afraid of losing myself and I needed to keep my feet on the ground. In that regard, I haven't changed." "There is no formula to it because writing every song, for me, is a little journey. The first note has to lift you and make you go, 'What's this?' You play C, but why is it that one day it leads to G and it didn't yesterday? I don't know. It's everything. It's the walk you take in the morning, it's the night before, the meeting with people, landscapes, the chats, all of that evolves in some way into melody, but I'm not sure how it's going to happen. I'm dealing with the unknown all the time and that is exciting." Although her mellifluous blend of synthetic symphonies, hymnal melodies and Celtic folk has sold more than 65 million albums worldwide, Irish singer Enya retains a certain mystique. She is a resolutely single woman, who never performs live and lives an apparently solitary life in a restored Victorian castle outside Dublin. Here she collects first editions, listens to her favourite composer Rachmaninov and, when the mood takes her, catches up with new releases on MTV. "I like to stay up-to-date with what's happening musically," says the 43-year-old,1 with just a touch of defiance, when we meet for a rare interview. "I wish people wouldn't think that such things were going to shock me. 'Wow! Does Enya really watch TV?' " With her fifth album, Amarantine, released by Warners this week, Enya is an undisputed international superstar, with that most essential of celebrity accessories, a stalker. In fact, she's had at least three, the most recent breaking into her castle in September and tying up a member of staff. Enya locked herself in her room and sounded a panic alarm, whereupon the stalker fled. "Those kind of people have been there from day one," she says. "Regardless of how I live my life, there are people who develop fixations that are not healthy. It could be a visual thing, or it could be the music that they are drawn to. These people need help." Early in her career, a stalker bombarded her with letters and stabbed himself when he was thrown out of her parents' pub in Gweedore, Donegal. She insists that such dramas have not made her shun the limelight. Enya sits with straight-backed poise on an antique chaise longue. She has a nice, eager-to-please smile, a quiet voice and big, almost spookily staring eyes. Her appearance and manner is stylish and expensive, yet also old-fashioned and quietly conservative. She exudes a sense of both reticence and control. "I'm not one for walking the beaches humming a melody," explains the woman regarded by some as a queen of the New Age. "I love the discipline of sitting in the studio, writing and listening. That is my domain." She has a 10-to-6 daily routine at least four days a week, and will ensconce herself for years at a time with producer Nicky Hopkins 2 and his lyric-writing wife Roma Ryan. The couple have nurtured Enya's talent since she was a precociously gifted teenager. "They are as much Enya as I am," she says. She was born Eithne Ni Bhraonain (Enya being an anglicised transliteration of her Gaelic name) into a musical family. She was classical trained and in 1980, at the age of 18, she briefly joined her older siblings in their groundbreaking folk group Clannad, who were then managed by Hopkins. "It was right in at the deep end. On the way to the first gig, we picked up a keyboard for me. I hadn't even played it. It was like, 'OK, we're on stage, I know this song, what's the key?' "
The next few years were spent in Hopkins's home studio, developing Enya's multi-layered sound - freeflowing melodies awash with synthesized strings and banks of breathy vocals. By the time her debut album Watermark was ready for release in 1988, Ireland was becoming a cultural powerhouse. U2, Sinead O'Connor and the Hothouse Flowers topped charts around the world, and Enya's music epitomised this new Irish internationalism: indisputably modern yet hinting at ancient folk roots. Strange enough to demand attention yet smooth enough for mainstream radio, Watermark went on to sell eight million copies. Enya might be considered a pioneer of ambient chill-out music, yet the unobtrusive quality of her soundscapes has not made her a favourite of critics, for whom her soft-centred, vaguely hymnal compositions amount to little more than mystic Muzak. It is easy on the ear without demanding much attention, which may account for its all-pervasiveness. Given this soothing, vaguely spiritual aura, perhaps it is no coincidence that Enya experienced a huge sales boom post-9/11, and was the world's biggest-selling recording artist of 2001. Enya herself seems immune to outside opinion: "I listen, but I don't take in what people say. I like what I'm doing." And what she is doing, in her mind, is pursuing elusive melodies. "There is no formula to it because writing every song, for me, is a little journey. The first note has to lift you and make you go, 'What's this?' You play C, but why is it that one day it leads to G and it didn't yesterday? I don't know. It's everything. It's the walk you take in the morning, it's the night before, the meeting with people, landscapes, the chats, all of that evolves in some way into melody, but I'm not sure how it's going to happen. I'm dealing with the unknown all the time and that is exciting." She plays everything herself. "I suppose there's a certain way I like the music to be performed, and I feel I can capture it better than anyone else. I know every note in every song, the whole history of it, even parts that were there and are gone." Given that Enya's music has barely changed over the years, you might think more than one album would be surplus to any listener's requirements, yet each of her albums has sold more than the one before. She describes her latest offering as "12 new stories. It is always going to sound like me." For all her protests of ordinariness, it is as if Enya has created her own musical world, only ever gate-crashed by the occasional stalker or intrusive journalist. "The word workaholic is so severe, but I do focus a lot on my work," she says. "I think a lot about what I'm doing in all aspects of my life, what am I trying to achieve here, am I happy with this? Music is like a mirror in front of you. You're exposing everything, but surely that's better than suppressing. "You have to dig deep and that can be hard for anybody, no matter what profession. I feel that I need to actually push myself to the limit to feel happy with the end result." 'Amarantine' is out now on Warner Bros.
1. 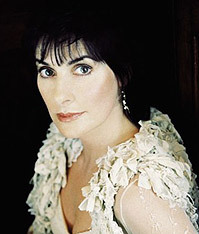 Enya turned 44 on May 17, 2005. 3. The press continues to act like Enya hasn't spoken to her family in years. Old Clannad rumors never die. I assume Neil McCormick was thinking of the Brennan family tribute in Donegal in July 2005, where Enya sang in church with her other sisters. Other articles from the time of the Amarantine launch also vaguely refer to a 'healing' in the family. I think they're looking for drama where drama doesn't exist.